New Year, new garden. . .
Dave Morgan suggests ways to improve your outdoor space without spending a fortune. One way of having a brand new garden is of course to move house – but that’s a bit extreme and very expensive if all you want is something different round the back of the house. Another way is to completely dig up the old garden and start all over again – but again that’s a bit over the top and a lot of hard work. But it is possible to totally change your garden without too much work and without huge expense. A few years ago the top half of our garden was 80 per cent grass with a small border along the one side, and a narrower border at the end. Easy to maintain, but extremely boring! We decided we really wanted to have something totally different and got an idea from visiting a garden near Feckenham that was open for the National Gardens Scheme (NGS), although we knew very little about the scheme at the time. As you entered this garden the path in front of you divided into two, so you had to make a decision, go left or right. Each grass path led through an arch and then disappeared around a bed that had some high-growing shrubs and plants in it, which meant you couldn’t actually see what was beyond the arches. So it was an adventure to follow the path and see what lay beyond. We decided to try the same with our boring grass, so it was a case of digging a large kidney bean-shaped bed into the lawn, leaving two grass paths either side, and then purchasing two inexpensive metal arches to be placed over the grass paths. Plants were chosen that would grow to a reasonable height, like rhododendrons, campanula and a twisted hazel, and climbers like clematis and golden hop were added to make use of the structural height of the arches. Over the years, as the plants have matured, they have hidden the garden behind and made it much more interesting to walk round. So far so good – but there was still too much boring lawn, so a new wildlife pond was created further up the garden and the surrounding area was planted with lower-growing plants like hostas and ajugas, so the pool could be seen. However, there was still room for a large zebra grass in front of the pond to give a little bit of a screen so that everything wasn’t immediately in view, and an acer behind the pond as a backdrop. These changes weren’t expensive or difficult to do but it made a huge difference and it was as if we had a brand new garden. So much so that once it had matured, and with a few other changes, we were invited to join a small group of other gardens open for the NGS – that was 10 years ago and we’re still opening! But we continue to change the garden to create a fresh new look – although sometimes it is necessity that is the driving force. For instance, one year a very large conifer had grown out of hand – and was planted too close to the house – so it had to go. But cutting it down allowed so much more light to that part of the garden that we could plant a host of new specimens, and the change to that part of the garden was quite striking. Even cutting a tree or hedge back can allow more light into a garden and create a new area that can be planted up, giving a new look to an old and unproductive area. Tired and less interesting areas like slab paths and low walls can be made more interesting with the introduction of pots and alpine troughs, and although antique troughs can cost a fortune, there are, thankfully, plenty of modern troughs that look almost as good and are a fraction of the price. Alpines are colourful, easy to grow and some of the cheapest plants to buy, often costing less than £2 each. 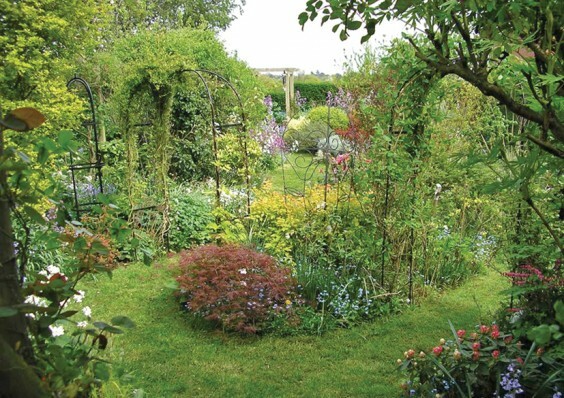 So making a new garden can be a lot less expensive than moving house and a lot less hard work that completely scrapping what you have and starting again – but with a bit of effort and perhaps picking up a few ideas from other garden owners, anyone can produce something that is almost as good as a new garden. One final suggestion is to introduce strategic seating around the garden so that you can enjoy the different aspects and different views of your new garden. At the same time, locate the area that receives the last of the late afternoon summer sun every day and put a couple of chairs and a table there if you can – because that will be a great place for an early evening glass of wine or an alfresco dinner! Visiting gardens open for the NGS is a great way of getting new ideas, and the new NGS season starts again with the first gardens open in Worcestershire in mid-February (see http://www.ngs.org.uk for listings). So Happy New Year and Happy New Gardening!